Busy Week Ahead | Canberra Quilters Inc. 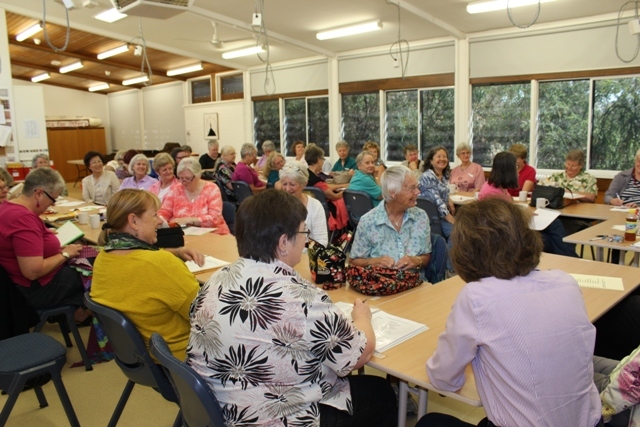 The second week of the month is always a busy one for the special interest groups of Canberra Quilters. These groups are open to any member to participate – they just might have what you are seeking. We have just had the Art Quilters meet on Saturday (9th). They generally have a mini-workshop of some kind and discuss art quilt ideas. On Tuesday(12th) the Quilts for Others (QFO) group meets between 10am and 2.30pm for its monthly working bee. Quilts are made for donation to various charitable organisations around the ACT – Tedd Noffs Foundation, Marymead, Karinya etc.Three hundred quilts were distributed in 2012. On Wednesday (13th) the ROWmakers design group meets 10.30pm until 12 noon. Participants in this group make a quilt, or a group of objects like bags, placemats or pin cushions over the course of a year. It started off in 2011 making a quilt row-by-row but has expanded in scope each year. This is the second meeting for the year and the first round is due to be revealed – incorporating green and circles/curves. Here is the first gathering for the year in February. We are all paying close attention to the instruction from convenor Joanne! On Thursday (14th) Creative Clothing meets between 10am until 2pm. This group is interested in making clothing and accessories tending to the creative end of the spectrum. Members discuss current projects, get help with fitting, cut garments out on the cutting tables. Co-convenor Michelle has some images on her blog http://buttontreelane.blogspot.com of last month’s get together. Of course there is the usual drop-in on Wednesday afternoon (1-4pm). This week the Friday drop-in won’t take place because of the Sue Bennett workshop in the room. Normal service resumes in Week 3 of the month.